For the past decade or so I've been very interested in creating artwork from already existing materials. The idea of rescuing what might otherwise be discarded and giving it new life through art deeply inspires me. 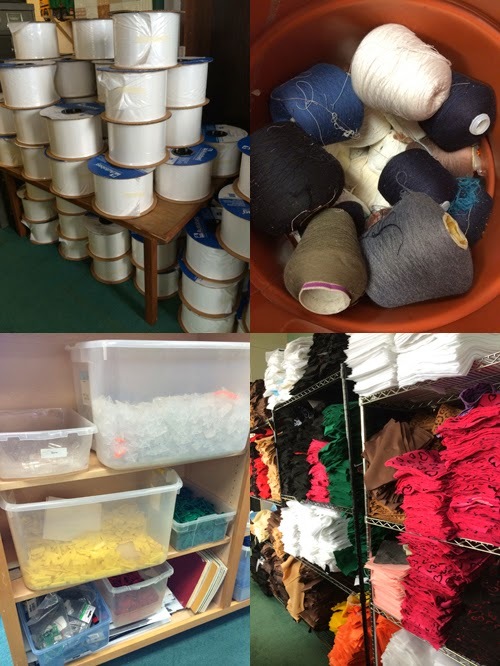 I recently had the opportunity to gather some materials from a non-profit warehouse full of donated items in Lynn, MA called Extras for Creative Reuse. 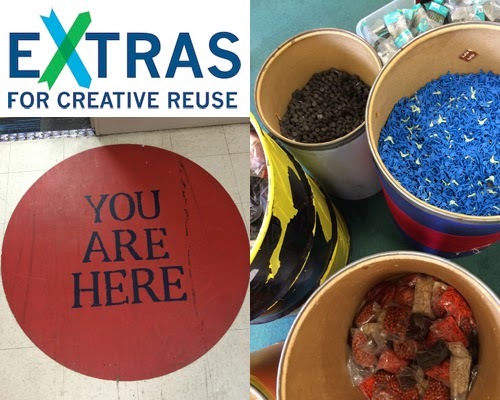 From their website, "Extras for Creative Reuse is a unique place where people come to be inspired and find materials to create, invent, explore, and learn. Each week, we divert about 10,000 pounds of materials from the landfills and help get them out into the learning and creative communities... For the past thirty-three years, teachers, artists, educators and parents have come to rely on Extras for our low to no cost materials to supplement their educational and creative arts programs and projects." The materials available are wide ranging including very large paper, random office supplies, so many fabric samples and scraps it will make your head spin, architectural samples such as tiles enough for thousands of mosaics, and unidentifiable thingamagigs to create just about anything from sculpture to imaginative functional items. All of these materials are donated from manufacturers, businesses, individuals and institutions from around New England. I came away with a large stack of rainbow colored felt, a giant roll of white paper, a year's supply of pens and paper clips, several books on crafting with kids, a large bag of wooden train tracks, and a small pile of strange items my son choose including tiny plastic "pirate bottles" and a vintage 1980's handheld Tetris game.